Recently, I traveled to Martha’s Vineyard to conduct some research at the Dukes County Registry of Deeds. There, as I was learning about property located in Tisbury, I came across some familiar folks – my great-great-great-grandparents! In another genealogical coincidence, I learned that the gentleman I was researching bought my great-great-great-grandparents’ home in Tisbury. I have written about this branch of my father’s family twice before, in My ancestor was born…where?! and Updating My ancestor was born … where? !, in which I pondered the origins of my great-great-great-great-grandmother Charlotte (Sears) Legge on the island of Saint Helena. As for my great-great-great-grandparents’ home, I wondered, where did it stand? 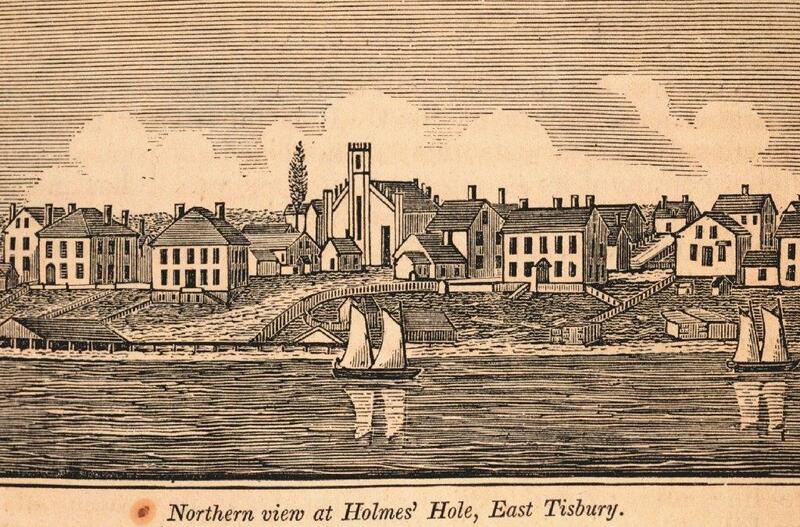 In 1881, Manley and Isabella (Legge) Smith sold their home on “The Neck” in Tisbury. From this deed, I learned that Isabella (Legge) Smith had received the property from my great-great-great-great-grandmother, Charlotte (Sears) Legge, in 1871, ten years. “The Neck” is the section of Tisbury located between Vineyard Haven and West Chop. Tracing the chain of title back, I learned that Charlotte (Sears) Legge purchased the home from Charles Dillingham in 1862. The property formerly belonged to Zenas Dillingham, his father, and was located “on the south by the lot formerly by Oliver Grinell, extending to Holmes Hole Harbor; thence easterly by said Harbor until comes to the land of Timothy Pease; thence Northerly by said Pease’s land about forty rods to the corner of the fence; thence westerly by said Pease’s land about four rods to the land of said Grinnell; containing half an acre more or less.” Here were some helpful clues, but nothing identified where the home was located. To learn more about the property’s location, I turned to the abutters of this property. And, in a deed recorded between Michael Daggett and Oliver Grinnell in 1827, I received a big clue. 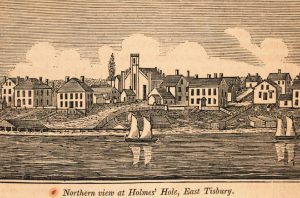 Here, Oliver Grinnell purchased “a certain house lot of land with a dwelling house thereon in Tisbury aforesaid lying in Frog Alley, adjoining Holmes Hole Harbor…” Two of the abutters were listed as Timothy Pease and Zenas Dillingham. So, my ancestors lived in Frog Alley. But where was that?! Examining early maps did not reveal its location, but newspapers did. “I live on Frog Alley. I often wish that the town had kept the name. It is now known as Owen Little Way, whatever that means, but when I was a boy everyone knew it as Frog Alley, and that had a meaning. On my next trip to Martha’s Vineyard, I will have to take a stroll down Owen Little Way to see where my ancestors lived. But, above all, this experience has served as a reminder that you never know what you mind find! Dukes County Registry of Deeds, Edgartown, 84: 240–41. “Gazette Chronicle: Frog Alley,” Vineyard Gazette, Edgartown, 10 September 2007. I love the old names that our ancestors gave sections of towns, Though I am not too keen on the name given to the area that I grew-up in. Recently I learned it was first known as East Renfrew, but after a bedbug outbreak they started to call if Bedbug Hollow. Thank goodness the nickname didn’t last long. Hooray for genealogical coincidence: aka Serendipity! I loved reading about your research in this area. When my husband and I visited Martha’s Vineyard, we got to stay in an 18th century house owned by multiple generations of my family (it still is! ), and tour a 17th century house built for my 8x great-grandfather, Simon Athearn, who was one of the earliest landowners in Tisbury. What a sweet story, and one that reminds me of the continuum in which we live. I have always loved the stories that came out of old-timers’ nostalgia. I learned about how things “used to be”, in the mysterious days before I was born (something that I was trying to grasp: the non-existence before existence). I’m still working on that, but along the way, I learned some important things, about how my elders viewed the world as it was and is now, how change is not always for the best but sometimes is, and most of all, that change was going to continue throughout my lifetime. And so it has. And I am the occasionally nostalgic elder who once stopped by my grandparents house in the hills back of the town I grew up in just to meet the current occupants. They were entranced as I took them on a tour of the grounds, pointing out not only the changes, but also the things I remembered. The house is older than they thought, and the original kitchen had a woodstove and a pump on the sink. A long line of trees at the back did not mark an old road, but the series of outhouse holes dug by my grandfather who then planted a tree in the one before; we followed the fenceline between fields to get there. And I showed them where shoots from my grandmother’s grapevines, though cut back, still grew where the big arbor had been. My family spent hours under it in hot weather playing cards and drinking ice tea. The next time I went to the area to visit, I drove by, and the grapes were thriving on a modern recreation of the old arbor! I have not been back since- the town has grown out and filled in all the space. But the house is still there, and so is the arbor (I looked it up on Google maps).